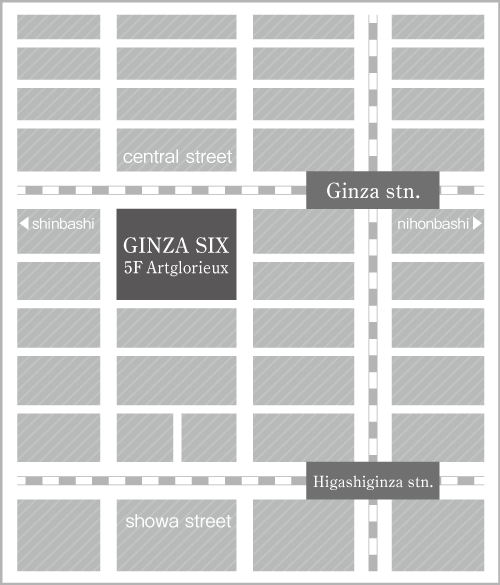 Tokyo's Ginza district serves as an art center for Japan. On April 20, 2017, we will open the new art gallery Artglorieux, rooted in more than 400 years of experience in the department store business. We combined the French words "art" (same as English) and "glorieux" (glorious) to create the gallery's name, and at this venue we hope to introduce visitors to art that continues to shine with glorious resplendence as it transcends the bounds of time and place. our goal is to exhibit art you have never experience before, art that will stir your soul. These efforts include opportunities to meet and speak with artists as well as introductions to works of art by professionals in the field. We hope that the things you see and experience at Artglorieux will become valuable treasures you can cherish for the rest of your life. Artglorieux is a gallery operated by Daimaru Matsuzakaya Department Stores Co., Ltd.